He had virtually no chance to win the Fountain of Youth on that speed-biased track and shortened stretch, but did everything you want to see in a Derby horse except pick up enough points to feel secure. And he was beaten by two very fast and talented horses. He can’t afford to have another bad set-up like this, especially if he gets another bad post or runs into serious traffic problems. This is why I’m not in favor of having only two Derby preps, especially for a stone closer. You better hope for at least one clean trip and a favorable pace scenario over a track with a normal stretch. To show what a near-impossible task he had, after dropping over 13 lengths out of it after the first quarter, he ran his next half in :45 3/5 and three-quarters in 1:09 4/5, then came home in :24 1/5 and :06 1/5 and still had no chance to catch two horses who had sprinted clear and gone eyeball to eyeball every step of the way. He looked best accelerating on the far turn, and wasn’t really gaining much on the leaders in the final yards. This is a true Derby horse with an explosive turn of foot. He just needs to be given a chance to win. Breezed a half in :49 4/5. So much for any news to report. Let’s turn to his pedigree, which is a mixture of everything, with speed and some stamina. He has far-removed inbreeding (4x7) to Aspidistra through Dr. Fager on top and Ta Wee on bottom. His sire, grandsire, and great-grandsire all finished first or second in the Kentucky Derby, and his broodmare sire sired a Kentucky Derby winner, so his pedigree has been successful on the first Saturday in May. I’m going to have to keep watching replays of the Holy Bull and Remsen to refresh my memory what he looks like in action. But in all seriousness, he’s no doubt a top-class horse and we’ll just have to wait to see how the fresh angle works out. Now that he appears to be back in a steady work pattern, breezing a half in :49 3/5 at Gulfstream, he once again is looking like a serious Derby horse, and with three more works scheduled before the Rebel (gr. II) he should be right back on schedule. He and Top Billing make for one dynamic Derby duo, and it’ll be interesting to see where Shug goes next with Top Billing. Will he follow the Orb route and stay in Florida or get the colt off that track? As for Honor Code, if there is a Triple Crown-type horse this year, it’s him, taking into consideration his regal pedigree, his ability to come from the clouds or track the pace if slow, and a classy 2-year-old campaign under him, racing against the likes of Havana and Cairo Prince. And he has the physical prowess, all prerequisites of a Triple Crown horse. As of Monday afternoon, still waiting for him to return to the work tab, as it’s been 16 days since the Robert Lewis. Sadler and CRK Stable have quite a 1-2 punch with Kobe’s Back. But at this point, Candy’s boy is the more proven of the two around two turns. The competition in California has not been as stiff nor as deep as the competition in Florida, Louisiana, and Arkansas, so it is important for these horses to mix it up in a big field. He showed what we he can do in a big field in the CashCall Futurity, so that experience will help him, but the small 3-year-old fields are not going to help in preparing a horse for the Derby cavalry charge. With the lack of an extraordinarily brilliant 3-year-old this year, like a Big Brown or a Smarty Jones, or a Bodemeister, he is intriguing despite his lack of stakes experience, because we don’t know how good he is and he has shown himself to be a fast, gifted horse, who Baffert referred to as push-button. Baffert said he will make his next start in the San Felipe, along with stablemate Midnight Hawk, who deserves another shot after one defeat. Bayern is one of several late developers who will be trying to overcome the Apollo curse this year. The way the Derby trail has changed over the years, it’s only a matter of time when one of these lightly raced dynamos gets it done. But for now the line has to be drawn at having at least four starts. He turned in a sharp 5-furlong work Monday in :59 4/5. This has been a text book career on how to steadily advance toward the first Saturday in May, with every race better than the one before, without any sudden leaps forward. He has now become a man and has put himself in excellent shape to peak on Derby Day. What I love about him are his consistently fast middle and closing fractions. In the Remsen, he came home his final eighth in :11 4/5. In the Holy Bull, he ran his third quarter in :22 4/5 and a middle half in :46 1/5. In the Risen Star, he saved the best for last, coming home in :24 1/5, :24 1/5, and :06 1/5, while running down a very good horse who had controlled the pace and was pulling away from everyone else in the field, opening up by 5 ½ lengths over third-place finisher and favorite Vicar’s in Trouble. That is the kind of sustained move and closing fractions that wins Derbys. If you’re a Beyer pundit, his figs have gone from a 77 to 81 to 84 to 98, and there is still plenty of room for improvement. If you look at his pedigree and balance out the speed and stamina influences, you pretty much have a solid mile and an eighth horse. The question now is, can he stretch that out enough to get the 10 furlongs on May 3? He does seem to be able to relax and loves Churchill Downs, which will help. He has good tactical speed and has shown excellent progress from 2 to 3, easily defeating much tougher competition at Oaklawn than he did at Churchill. His sire is red-hot, he has a top trainer, and, as I mentioned last week, his birthday falls out on Derby Day. So, all in all, you have to consider him a major threat at this point, with some good karma attached to him. He’s back in the Top 12 after a strong :48 1/5 breeze and Casse announcing he will make his next start in the Tampa Bay Derby (gr. II). And remember that Intense Holiday finished a fast-closing 3rd in the Holy Bull (gr. II) and this colt caught him for second. So, all in all, it was a good week for him, and I’m happy to hear he will be getting away from Gulfstream. Passing the Fountain of Youth proved to be a blessing, as the best he possibly could have finished was fourth. This colt has made a dramatic change in his running style, and although he’s now a closer, he does have that natural speed to explode at any point in a race, as he showed in his allowance score at Churchill last November. One of his foes in the Tampa Derby will be his stablemate Matador, who was a close fourth in the Sam F. Davis, giving him a solid race over the surface. 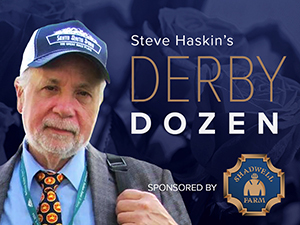 There were no points to pick up in his third-place finish in an allowance race, so winning was not as important as looking like a Derby horse, and he certainly did that. Like Top Billing he had no shot to win on that track, but he was really rolling down the stretch and was just building up a head of steam on that short stretch when the race was over. What I found most impressive was the fact that every other horse in the race lost ground to Constitution in the final furlong, while he made up three lengths. He’s already shown he has tactical speed when he romped at Delaware Park, and has been working with the emphasis on a late closing kick, which did him little good on Saturday other than move him forward and on to bigger and better things, whether it be the Derby or the Belmont. That style will help in the long run, and I still believe this is a top-quality colt who will only get better as the distances stretch out. He actually might have shown a little too much speed coming out of the gate, as Rosario kept looking over trying to get in and wound up going at least 5-wide into the turn. He certainly seems to have found a home at Los Alamitos, turning in another stellar work, this time going six furlongs in 1:11 4/5. I’ve said pretty much all there is to say about him, but will reiterate how much I love watching him run. He seems to be putting everything together the right way and at the right time, and while still unproven in open company, I can’t help but feel that he will continue his ascent against better horses. Using grade I winner Tamarando as a gauge, you have to believe his total dominance over such a talented horse establishes him as a legitimate Derby threat. But he still has to go out there and prove he can compete with horses like Candy Boy and perhaps even Bayern. I have little doubt he’ll be up to the task. He may have narrowly lost the battle in the Fountain of Youth (gr. II), but he looks more like the one who altered his running style slightly to suit the track. He couldn’t let Wildcat Red get loose on the lead, so he deviated from what he does best, which is stalking, but came away looking like a legitimate Derby contender. One thing we do know about him, he is a tough competitor, consistent, and fast, and you’re going to have to reach deep down to beat him. He’s not one you want to eyeball at any point in the race. Maker knows a good horse and he is convinced this colt is the real deal, and that just solidifies it. I feel both colts, who earned a 101 Beyer, will continue to carry their speed successfully, but he has more overall stamina and that gives him the slight edge. He looked good visually winning a top-class allowance race, but on that track I still have no idea how good he really is. Although he was able to get away with a :47 3/5 half, he did throw down the gauntlet with a :23 1/5 third quarter and was just too strong in the stretch. He has the look of a class horse and was striding out beautifully in the final furlong, with some very talented horses futilely chasing him home. Like Bayern, he has no stakes experience, and not having started at 2, he has to take on Apollo, who is undefeated in 132 years. His pedigree is fairly strong, but his tail-female family doesn’t knock you out. The bottom line is, to come off one seven-furlong maiden win and defeat proven distance horses like Tonalist, Mexikoma, and Wicked Strong is pretty impressive. The standings are getting tighter, with STRONG MANDATE, WILDCAT RED, VICAR’S IN TROUBLE, KOBE’S BACK, TONALIST, WICKED STRONG, SAMRAAT, UNCLE SIGH and others hovering right above the Top 12. But the horse I am watching closest of all is HOPPERTUNITY, who I was expecting to hit the Top 12, but will have to wait following his unfortunate fourth, beaten seven lengths, in the Risen Star. I believe, however, that this is the time to get in on a good thing, as that race should propel him into a huge effort next time out, in which he’ll be able to show just how good a horse he is. First off, he broke a bit flat-footed and got squeezed slightly, and that was just enough to cost him valuable position, as he dropped back to 10th behind a :47 3/5 half. In his last start, he was a length off a :46 3/5 half, tracking in third. In the Risen Star, he was being pushed a long way out to try to make up lost ground, and finally had to swing eight or nine wide turning for home. When Commanding Curve drifted out in to his path, he had to go inside him. Although he was well out of it at this point, back in seventh, I did like the way he finally leveled off and was striding out in the final sixteenth to finish fourth, 1 1/2 lengths behind third-place finisher Vicar’s in Trouble. You have to remember, he had made only two career starts, this was his first stakes appearance, and the three horses in front him had made a total of 13 career starts, seven of them in stakes. So, don’t give up on this colt just yet. I had been contemplating putting STRONG MANDATE back in the Top 12 if there was room for him, as it appeared on second glance he simply needed the Southwest after losing a lot of ground and getting tired, which may have been the reason he changed leads five times in the stretch. But watching the head-on shot several times, he appeared to be continuously trying to get out, and even when he ducked in from a right-handed whip and switched to his left lead, he quickly drifted abruptly back to the outside. This is an experienced grade I stakes performer, who shouldn’t be all over the track like that. With that said, I am still willing to chalk up the defeat and the meandering stretch run to getting tired, and would hope he puts it all back together in the Rebel, assuming that’s his next start. Talent-wise, he can beat anyone on his best day; he just needs to be more consistent and professional. Although VICAR’S IN TROUBLE ran a good third from a bad post in the Risen Star, he actually had a pretty decent trip and was able to tuck in nicely going into the first turn, but just seemed to get tired in the stretch. Until we find out how far he wants to go, he’ll have to remain just out of the Top 12. WICKED STRONG’s fourth-place finish in the Gulfstream allowance race was a pretty good rebound effort, but I’m very surprised they kept him at Gulfstream after he bombed there in the Holy Bull. His running style is not conducive to that track. But it was a step in the right direction and I haven’t given up on him by any means. With New York-breds and Louisiana-bred asserting themselves on the Derby trail this year, why not a New Mexico-bed? PROCEED, a son of the Fappiano stallion Desert God, remained unbeaten with a two-length victory in the Mine That Bird Derby at Sunland Park, covering the 1 1/16-miles in a sharp 1:42 2/5. He has now won all three of his starts by a combined 21 1/4 lengths. Over at Turf Paradise, LOTSA MISCHIEF made it four wins in eight starts, winning the Turf Paradise Derby by 2 1/2 lengths, his first race going two turns. The My Meadowview Farm pair of SAMRAAT and NOBLE CORNERSTONE both had good works, with the former breezing a mile in 1:45 and Noble Cornerstone a solid five-eighths in 1:00 3/5 breezing. Also on the New York-bred front, UNCLE SIGH returned to the work tab with a bullet five-furlong breeze in :59 4/5 for Saturday’s Gotham Stakes. If he bounces back from that gut-wrencher in the Withers, he should very tough to beat. Todd Pletcher worked Sam F. Davis winner VINCEREMOS five furlongs in 1:01 3/5, Swale Stakes hopeful HAVANA five-eighths in 1:00 4/5, and Gotham possibles HARPOON and SURFING USA a bullet half in :47 4/5, fastest of 58 works at the distance. Bob Baffert worked two of his top 3-year-olds, sending out MIDNIGHT HAWK for a five-furlong drill in :59 3/5 and Robert Lewis runner-up CHITU five panels in 1:00 2/5. El Camino Real Derby winner TAMARANDO stuck around up north, breezing a half in :49 4/5 at Golden Gate. Sham Stakes runner-up KRISTO turned in a sharp 6-furlong work in 1:10 4/5 for John Sadler.